Not to be confused with World 4-6. Area 4-6 is the sixth course of Warped Mansion and the thirty-third course overall in Mario vs. Donkey Kong: Mini-Land Mayhem!. 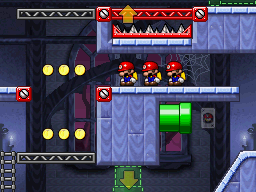 The Mini Marios begin on a platform on the top center (just below a Spike Trap), with the exit door on the bottom right. In order to reach it, the Mini Marios must split up and utilize the Green Pipes and Red Girders in the area while evading the Shy Guy guarding the exit door. The M-Token is located on the bottom center, atop the left end of a Red Girder platform. To collect it, a Mini Mario must use said Red Girder platform after collecting the Mini Mario Card and sliding down the subsequent slope. The Mini Mario Card is located near the top right, just to the right of a Green Pipe entrance. A Mini Mario must simply exit said Green Pipe entrance to reach it. In Plus Mode, the Mini Donkey Kong must be guided to the exit door first, followed by the Mini Pauline.